Your professional hair stylist portfolio is something you should start while you are in cosmetology school. But it's never too late to start from where you are. A professional hair stylist portfolio can be built over the lifetime of your beauty career and be used for any number of things. You always want to give the impression that you are current and revelant. Hard copy portfolio's used to be the thing, but everything now is going digital so grow with it. Having a digital professional hair stylist portfolio will make you look like a true professional! The best way to always have it available and easy to see is by having it on your Ipad or similar device. It is very portable and the screen is adequate size. There are several different formats you could use to develop your digital portfolio and even more than I am aware of. You could use Microsoft Office PowerPoint. You can add music, add text, show your personality, manage the transitions, etc. You can use a free website, like Wix.com. You can use folders in your photo gallery. You can use an app to make a movie. You can use an app to make a gallery. Your professional hair stylist portfolio can be as simple or intricate as you like. However you choose, make sure that it compliments your purpose. For example, if you are using it to help you land a job you want to keep it simple and showcase an example of haircutting, hairstyling, color, and anything else relevant to the position. Having a digital portfolio also affords you the ability to change it in a moment's notice to suit your purpose. If you are trying to land a bridal gig, have a section of updos to showcase a bride. If you are going out marketing, use the categories of hairdressing that you do regularly so you can do a consultation on the fly. SPECIAL NOTE: Most certainly your portfolio is made up of your own work. 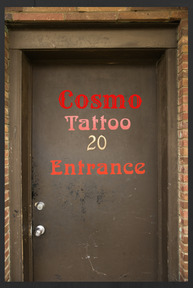 However, for the use of Marketing to build your clientele I don't believe it's 100% necessary. In the following video I show you how to use your digital portfolio. If you are doing a spontaneous consultation you will want a lot of pictures of current trends you can use for suggestions. Those don't have to be Yours! You could use the trend pictures for your salon consultations as well. Kinda like a design book, except with more current pictures! So here's my suggestion. Have one separate file with many sub-folders in categories like ombre, all over color, highlights, blondes, bangs, natural hair, clipper cuts, etc. Collect photos from anywhere you find something interesting. Use THIS folder only for marketing and salon consultations. Do Not try to pass any off as your own work though. Build another File with sub-folders of your work only. 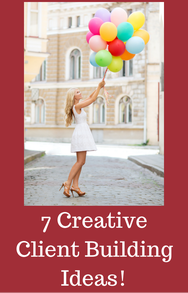 Let me show you How to Effectively Use Your Digital Portfolio to Build Clientele! 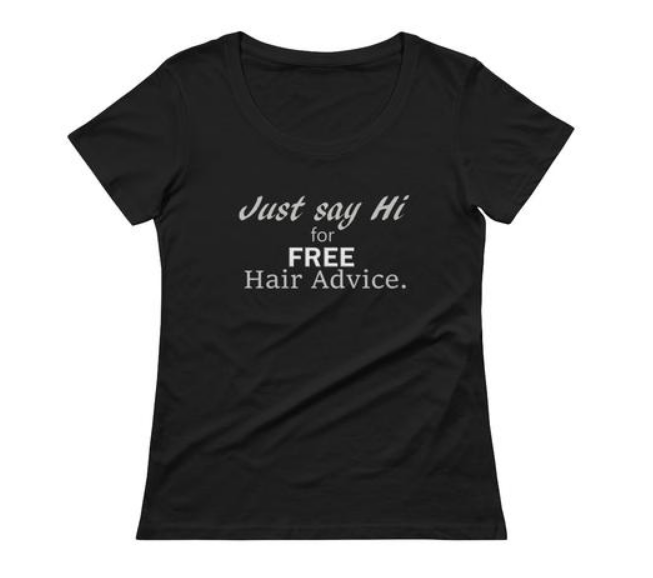 Check out the page for Building Clientele Techniques that has the full Vlog Series on effectively using hairstylist marketing tshirts and a digital portfolio! I know you are experimenting on your friends! Get in the habit of doing before/after pictures of the services you perform. Use a high pixel camera: The larger your image on a digital pad the more pixels you need to make it high quality. Shoot for 8 pixels or above. Use a solid background: you can go to the fabric store and buy a large sheet of a solid color fabric to drape over doors. Get a dark one for lighter hair and a lighter one, like gray, for darker hair. You don't want any patterns as it takes away from the subject which is the hair. Look in the clearance fabric first! I think I paid $2 for my backdrop. Have your subject camera ready: you may be taking shots from the back and it won't matter. But if your subject is female and her face will be showing, have her makeup done. This is your beauty career and every element you put in front of a client or another professional will reflect back on you, good or bad. Get your lighting right: Very seldom is your flash enough to generate the proper lighting for a head shot. You can do the best with what you've got, then use a photo editing app to make it more presentable. Or you can put a little thought into your lighting. Check out the video I found on YouTube to help you with lighting. Use interesting posing: we can "hack" our way to rock star status, remember? Just because you are not a photographer doesn't mean you can't use techniques that the professionals use. We don't want to look ordinary, we want to stand out and DAZZLE! Make your posing agree with your portfolio purpose. Bridal gigs? Soft facial expressions, looking up dreamy, looking down sweet. Get it? Big time fashion pics? Stoney stares, appropriate makeup to fit the hair. Notice how the photographer used a fan? Imagine your amateur photos for your professional hair stylist portfolio using these types of elements. You will look much better than you actually are. That is the beauty of hacking techniques. You take the best from the best and apply them. Group portfolio pictures into categories: Cutting, styling, braids, color, weaves, etc. Keep your professional hair stylist portfolio organic: keep it current by changing out selections as needed over time. Being digital makes it super simple. When you get your license and begin your beauty career you may want to invest a little more into your pictures for your professional hair stylist portfolio. If you want to look like the DAZZLING STAR in your salon, suggest a photo shoot studio for the salon. I believe you can get a fabric backdrop, light modifiers and an umbrella for $200. A really good camera would cost about $750. So for under $1000 your salon could have it's own photo studio. OMG! A bunch of things, only limited by your imagination! Think of all social media. 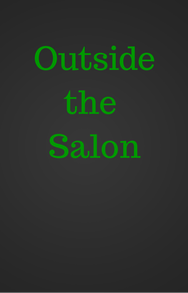 Now image your salon on all of them using the before and after photos of your clients. You gather followers and grow the salon. Your salon gains momentum, develops a reputation, increases credibility and trust. Are the stylist's making money? You bet they are. And who is to thank? YOU. Sounds like a great idea, huh? Ok, now replace salon with YOU. How can you use YOUR professional hair stylist portfolio? Having a digital portfolio means power in your hands. Use it to build your clientele. If you have it on you when handing out your hairstylist business cards, show a potential client what you have in mind for her. "I'd love to do your hair! I was seeing a soft fringe around your face to frame your beautiful eyes." "Oh really, I don't know if that's right for me"
"Well, here, let me show you real quick what I was thinking." Can you see how effective this is? 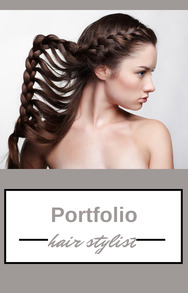 Make numerous professional hair stylist portfolio's. You are digital, right? Make one general portfolio for interviewing. Make a movie portfolio to post on YouTube and get your name out there. Link it to your website. Make the music fit your target market! Music is a powerful motivator, it evokes emotion and emotions are the fuel that drives people to decisions. Make specific galleries to show potential clients. This way you won't have to scan through to get to the right picture for her and waste her time. Like have a gallery for bangs, a gallery for highlights, a gallery for lowlights, a gallery for all over color with before and afters, etc. And keep building. Never stop updating it, replacing pictures with better pictures. Always be improving. 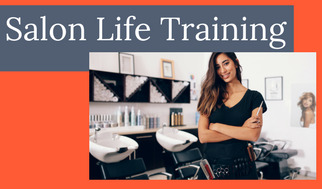 Your beauty career is growing and so should your professional hair stylist portfolio. Did This Page Help You Out? Pay it forward and pass it on. Click on a button below. Thanks!